Around four years ago, I sat down and decided I wanted to start another blog. A blog where I could write about my thoughts on books, inspired by discussions I had on literature while I was attending university. The word blog is a weird in and of itself. Then we have the word blogiversary. What has the English language come to? I decided to ask the internet, yes, the internet, if anybody had any questions about my writing or blogging process. Here are the questions and my answers. Stick around because I’m running a giveaway at the end! Why did you start Word Storm? And why a blog and not any other social media? I started Word Storm because bookish discussions make me excited. When I was in college, I wanted to continue to talk about books outside of classes. Now that I’ve graduated with my degrees in English and English Literature, I’m glad I started my blog when I did. I picked a blog because I’m not very outgoing when it comes to other forms of social media. I have a Twitter and an Instagram account, but I’m chattier in the blogisphere. Also, I prefer writing over talking, so you probably won’t hear/see me on YouTube anytime soon. Read more about Why Word Storm? on my About page. What inspired you to write blog posts? It all depends on the blog post. When I started blogging, college classroom discussions inspired me. Now, I draw inspiration from the books I read, trends I see, you name it. My last blog post, A Guide to Getting Lost in Your Local Library, was inspired by my constant visits to my library where I like to volunteer and bring home one too many books. Actually, I’d say fewer of my blog posts come from inspiration than hard work. Inspiration is a term that’s way overused. Maybe 1% of writing is inspiration and 99% is actual writing. And that inspiration? Its name is coffee. Did your family play a role in your interest in writing? Yes and no. Both my parents gave me a passion for stories and reading. My mom especially used to tell me many outlandish stories when I was a kid, so like Hiccup, at least I know where I get my dramatic flair from. But most of my interest in writing came from other writers like C. S. Lewis, who wrote fantastical tales, and Mary Elizabeth Edgren, whom I got to meet as a kid, and teachers who encouraged me to craft stories of my own. 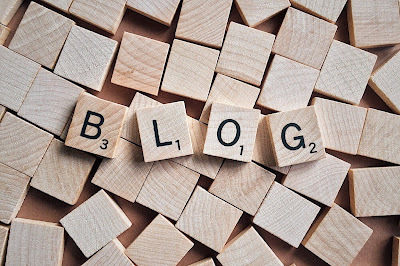 What role does God play in your blogging? Whatever I write, I do it for the glory of God. As such, I try to write without being overly preachy. Growing up as a chaplain’s kid, I know what a sermon sounds like. Still, I aim to prompt thought and discussion from readers, regardless of their background. As a Christian, I like to talk about wholesome stories that uplift and encourage. I try to keep my blog PG, even if some of the books I read are not. All the same, I try not to shy away from topics that may be controversial. In fact, I wrote a whole series of posts entitled “Controversy in Fiction,” addressing topics like Racial Diversity, Feminism and Female Characters, Magic, and Christian Fiction. Are you ever going to write more about the Memory Keepers? Maaaaaaybe. I have some ideas. While I haven’t settled on a particular story line, if I were to write more in the Memory Keepers’ world, the story would most likely involve trains, explosions, and journalism vs. academic writing. 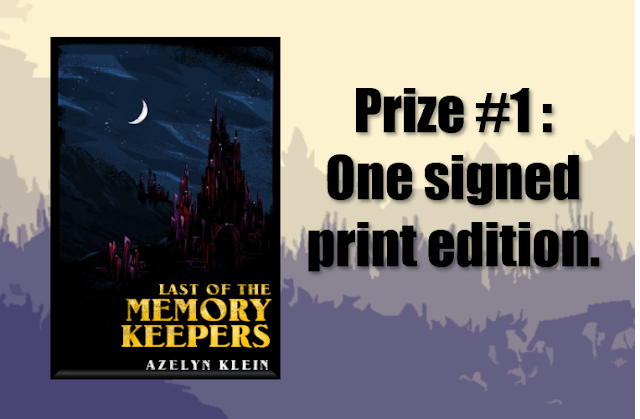 First I’d need more reviews for Last of the Memory Keepers. If you’ve read any of the stories, please consider writing a review and posting it on Amazon and/or Goodreads. It doesn’t have to be long, and I welcome honest feedback. Did you know more reviews means more exposure? So, if you like a book, leave a review! When you start plotting a story, where do you prefer starting? Characters, settings, storyline, something else? Ideas can come from anywhere. Sometimes they come in the form of characters, sometimes in the form of witty quotes. But my plotting is a little more structured. Before I start, I’ll give it a rough name, which can be anything from Story Idea 11 to Just Breathe (original title for Origami Swan). Then or simultaneously, I’ll pick a genre and a target audience. Both are vital for understanding how long the story will be and how much research I’ll need to do. When I write my basic outline (inciting incident, turning point, climax), I’ll typically start with the characters. I need to know my main players. Who they are. What they want. How they influence the plot. I’ll write this bit in a notebook so it’s portable and so I can add details wherever I go. Once that’s done, and sometimes even before then, I’ll put some meat on the bones by writing a complete synopsis. That’s when I figure out how the plot influences the characters. I write this part on my computer so I can rearrange, change, or add details if necessary. And that’s about it. I used to write chapter-by-chapter, but later found it was too tedious. See 3 Methods for Outlining Your Novel. Slight side-note: I’m not participating in NaNoWriMo this year, camp or otherwise. 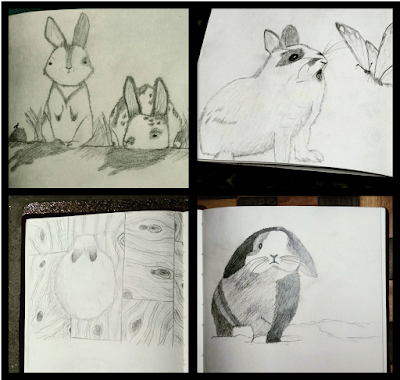 So… I’m taking July to do #31DaysofBunnies instead! That’s right. I’ve been trying to take up drawing for a while now, and I haven’t really sat down long enough to draw, unless you count during class once a month. As my next novel may include bunnies, I’m thinking of doing some of my own illustrations. That and they’re just fun to draw. Now, the moment you’ve all been waiting for. Giveaway time! Please keep in mind that because of shipping expenses, I will only be giving away a print copy to a person with a US address. If you happen to live outside the States, you may still enter for the chance to win a Kindle/Nook edition of the first three novelettes. Let’s chat! 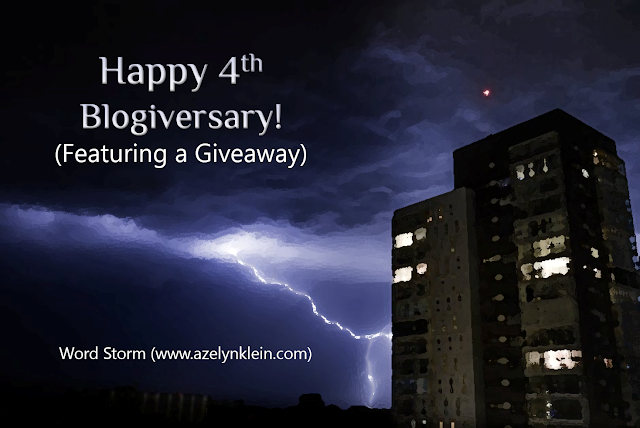 Any other questions you might have about Word Storm or my stories? What’s been your top book(s) of 2018 so far? Congrats on the blogiversary! 4 years is a long time to keep up with a blog! Thanks! Bunnies are pretty fun to draw. I like learning about the different breeds and art styles.